Brussels Sprouts have a mild cabbage like flavor but are more tender and tasty. The edible parts are numerous small heads that form on the stalk. A delicious vegetable for fall and winter use. Water regularly and fertilize every 4 to 6 weeks. When the sprouts begin to form, remove the lower leaves to force all nourishment into the sprouts. The flavor is improved by frost, so delay harvest of late crop until after first frost. Planting time - Early Spring or indoors in CowPots 5 to 7 weeks before danger of frost is past. 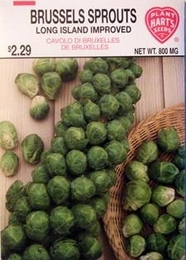 Bulk Brussels Sprout seed available. 9,000 Seeds/oz. Plant 1/4oz per 100ft row. 3lbs of Brussels Sprout seed needed per acre, 8oz needed per acre if using transplants.